They are represented by tiny filaments, knobs and tubes in Canadian rocks dated to be up to 4.28 billion years old. That is a time not long after the planet's formation and hundreds of millions of years before what is currently accepted as evidence for the most ancient life yet found on Earth. 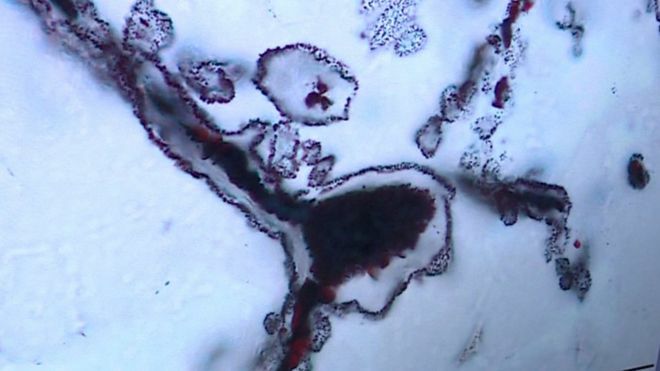 The scientists' putative microbes from Quebec are one-tenth the width of a human hair and contain significant quantities of haematite - a form of iron oxide or "rust". "This discovery answers the biggest questions mankind has asked itself - which are: where do we come from and why we are here? "It is very humbling to have the oldest known lifeforms in your hands and being able to look at them and analyse them," he told BBC News. The fossil structures were encased in quartz layers in the so-called Nuvvuagittuq Supracrustal Belt (NSB). The NSB is a chunk of ancient ocean floor. It contains some of the oldest volcanic and sedimentary rocks known to science. The team looked at sections of rock that were likely laid down in a system of hydrothermal vents - fissures on the seabed from which heated, mineral-rich waters spew up from below. Today, such vents are known to be important habitats for microbes. 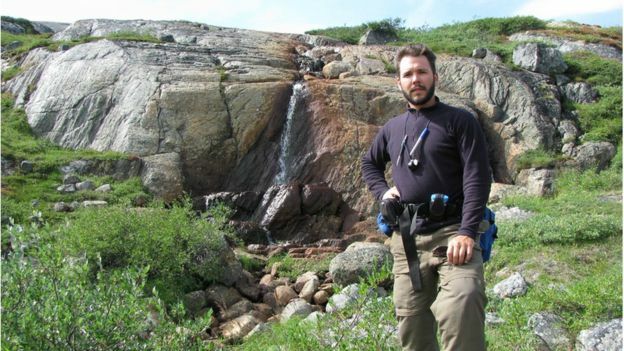 And Dr Dominic Papineau, also from UCL, who discovered the fossils in Quebec, thinks this kind of setting was very probably also the cradle for lifeforms between 3.77 and 4.28 billion years ago (the upper and lower age estimates for the NSB rocks). He described how he felt when he realised the significance of the material on which he was working: "I thought to myself 'we've got it, we've got the oldest fossils on the planet'. "It relates to our origins. For intelligent life to evolve to a level of consciousness, to a point where it traces back its history to understand its own origin - that's inspirational." Any claim for the earliest life on Earth attracts scepticism. That is understandable. It is often hard to prove that certain structures could not also have been produced by non-biological processes. In addition, analysis is complicated because the rocks in question have often undergone alteration. ซากฟอสซิลดึกดำบรรพ์อันกระตุ้นความสนใจมากๆที่พบนี้เป็น microbes (หรือสิ่งมีชีวิตประเภทแบคทีเรีย) ขนาดเล็กจิ๋วมาก พบที่จังหวัด Quebec / Canada ขนาด 1/10 ของความกว้างของเส้นผมมนุษย์ และมีสาร haematite ในปริมาณมาก - haematite เป็นสนิมเหล็กประเภทหนึ่ง. Matthew Dodd, ผู้เป็นเจ้าของผลงานวิจัยที่ University College London, สหราชอาณาจักร, อ้างว่าการค้นพบครั้งนี้จะให้ความสว่างใหม่ๆเกี่ยวกับเรื่องกำเนิดชีวิต เขาบอกว่า "การค้นพบของเขาครั้งนี้ให้คำตอบต่อคำถามที่ใหญ่ที่สุดที่มนุษยชาติถามตัวเองมาตลอดเวลาว่า - "เรามาจากไหน และมาทำอะไรที่นี่?" This material is said to show remnants of stromatolites - mounds of sediment formed of mineral grains glued together by ancient bacteria. An even older claim for stromatolite traces was made in August last year. 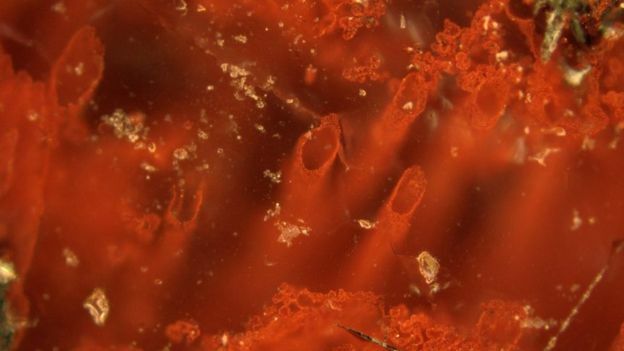 The team behind that finding said their fossil evidence was 3.70 billion years old. Nonetheless, the UCL researchers and their colleagues say they have worked extremely hard to demonstrate the greater antiquity for their structures. Dr Papineau does concede though that the idea of metabolising micro-organisms using oxygen so soon after the Earth's formation will surprise many geologists. 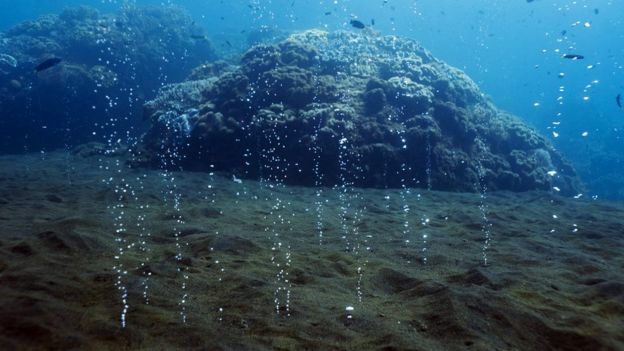 "They would not consider that there were organisms breathing oxygen at this time. It brings back the production of oxygen on the Earth's surface, albeit by tiny amounts, to the beginning of the sedimentary record," he said. Prof Nicola McLoughlin from Rhodes University, South Africa, was not connected with the research. She commended the scholarship but felt the data presented by the UCL-led team fell short. "The morphology of these argued iron-oxidising filaments from Northern Canada is not convincing," she told BBC News. "In recent deposits we see spectacular twisted stalks, often arranged in layers, but in the highly metamorphosed rocks of the Nuvvuagittuq belt the filaments are much simpler in shape. "The associated textural and geochemical evidence of graphite in carbonate rosettes and magnetite-haematite granules is careful work, but provides only suggestive evidence for microbial activity; it does not strengthen the case for the biogenicity of the filaments." She also said the maximum age of the rocks had proven to be very controversial, and that the true age was more likely to be closer to the 3.77-billion-year age. Part of the interest in ancient life is in the implication it has for organisms elsewhere in the Solar System. 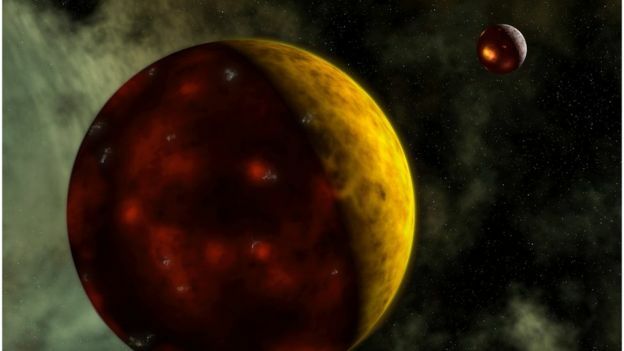 "These (NTB) organisms come from a time when we believe Mars had liquid water on its surface and a similar atmosphere to Earth at that time," said Mr Dodd. "So, if we have lifeforms originating and evolving on Earth at this time then we may very well have had life beginning on Mars." If that is the case then, according to Dr Papineau, recent Nasa rover missions to the Martian surface may have been looking for signs of life in the wrong places. He said that the Mars Exploration Rovers (MER), Spirit and Opportunity, and the more recent Curiosity robot mission had overlooked areas that might have had rocks produced by hydrothermal vents. "On the surface of Mars there have been missed opportunities. The MER Opportunity in 2003 found promising formations but there was no analysis. And the Spirit rover went straight past another near the Comanche outcrop in Gusev crater." 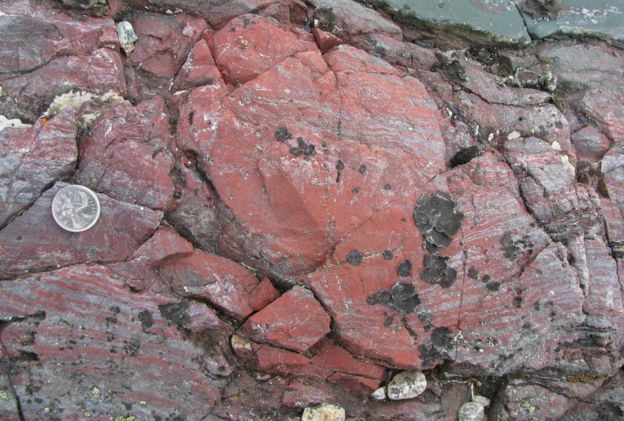 The suggestion that life had already arisen "just" a few hundred million years after the Earth had formed is intriguing in light of debates about whether life on Earth was a rare accident or whether biology is a common outcome given the right conditions.